Coarse-grained, ramp-like feature that partially infills a chute channel. Formed at the upstream ends of bends and rise up from the channel to the bar surface. 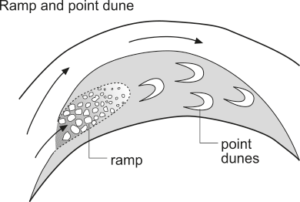 Dune bedforms that accrete along convex banks, generally atop compound point bars. These features have a down-valley alignment, rather than reflecting around-the-bend trends. Under high flow condition flow alignment over the bar short-circuits the main channel. A relatively straight channel is scoured. Sediment is subsequently ramped up the chute channel, partially infilling this feature with high-energy deposits, such as gravel sheets or migrating dunefields. Produced when high magnitude flow is aligned down-valley rather than around-the-bend, typically in sand-bed streams. Formed at high flood stage, when the thalweg shifts to the inside of the bend (over the point bar). Preserved in the falling-stages when the thalweg switches back along the concave bank of the channel bend.